Our biggest little is 11 years old. I don't know how that is possible. Trying to control Elijah's seizures, dealing with behaviors, living life in general. But, currently? Life is feeling pretty great. Elijah's had food allergies since he was 8 months old. Over the years, more allergies were added to the list (including dairy, egg, peanut, tree nuts, garlic and onion). But, a couple of weeks ago, we had some more allergy testing done. All of his allergens are now testing negative! He'll be having a peanut challenge at the clinic in November. We've added dairy into his diet and started eggs, too. It feels invigorating to be able to feed Elijah more foods. (As a side note, both brothers have also have/had allergies. Oliver had a peanut allergy, which he has now outgrown. Theo also has allergies that we hope he also outgrows). 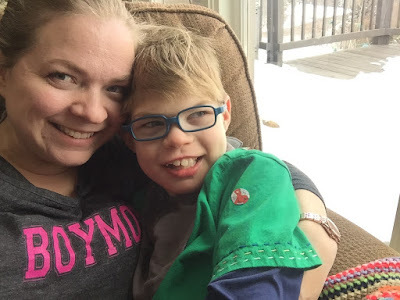 Elijah hasn't had a seizure in several months, which is obviously a relief. We've settled into a new normal where seizures don't consume our constant thoughts. We hope and pray that this continues. Elijah has been super sweet lately. He likes to clap his hands and loves when we clap with him. He gives hugs, albeit rough-running-into-you-at-full-speed ones (we're working on that). He likes to get into trouble to get attention. Basically life is pretty awesome. Challenging, yes. But awesome. We're so thankful for our eleven-year-old.